In the past couple of years, the tourism mafia of Austria has discovered a new target group: Gay and lesbian tourists. Since then, the amount of advertising to this group of people has steadily increased - to a suspicious extent, given that Austria is a thoroughly conservative country. This has a simple reason: Many homosexual couples on tour are "DINKs" (Double Income No Kids) and thus spend more money than the average tourist. This makes gays and lesbians attractive guests for hotels, bars and shops, which have started to develop "custom-made" offers for homosexuals. And this is exactly where we are getting annoyed: The tourism mafia behaves as if the needs and interests of homosexual guests were in some way fundamentally different from the rest of Salzburg′s millions of visitors. Have you ever come across a "hetero-friedly hotel"? Seen an article on "Salzburg for Heteros"? We haven′t, and we think that most prospective visitors of Salzburg will find plenty of useful information on our website regardless of their sexual orientation. Of course Salzburg has a gay scene - with a population of 150,000 people, it would be rather odd if it hadn′t. However, there are few bars that are explicitly gay and they don′t necessarily target tourists, but rather locals. Therefore, consider the following information to be mainly for those international gay people who come to Salzburg for a longer period of time and look for contact points. The "2-Stein" (speak: Zweistein) next to Hotel Stein right at the meeting spot of Steingasse and Linzergasse is the flagship of Salzburg gayness. Unlimited bumfun was also promised by a couple of other bars that have come and gone around the area of Gstättengasse over the course of years, but none of them has left much of an impression. 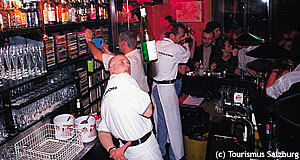 The Princess Bar in the Priesterhausgasse ("Priest′s House Lane") is another long-standing gay venue. Gay friendly bars are indicated by rainbow flags at the doors, just like elsewhere in the world. The Rosenhügel just at the entrance area of the Mirabell Gardens is a gay meeting spot in the late evenings, dating back to the time when homosexuality was prohibited and confined to the edge of society (or the Mirabell Gardens). If you happen to stay in Salzburg for a longer period of time, you might be interested in going to the HOSI, a gay, lesbian and transsexual association that runs an information centre at Gabelsbergerstraße 22, not far from the main station. The HOSI organises gay festivals four times a year in the ARGE Kultur in Nonntal.